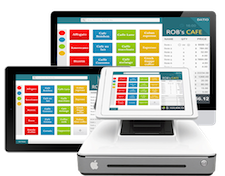 Selling gift cards is a great way to add revenue to your business and keep your customers happy. Datio POS gift cards are barcode based. 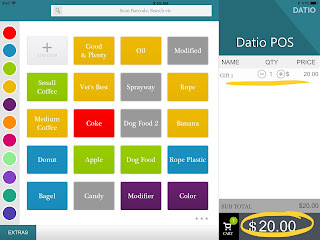 You can order generic starter gift cards from Datio POS in quantities of 20. 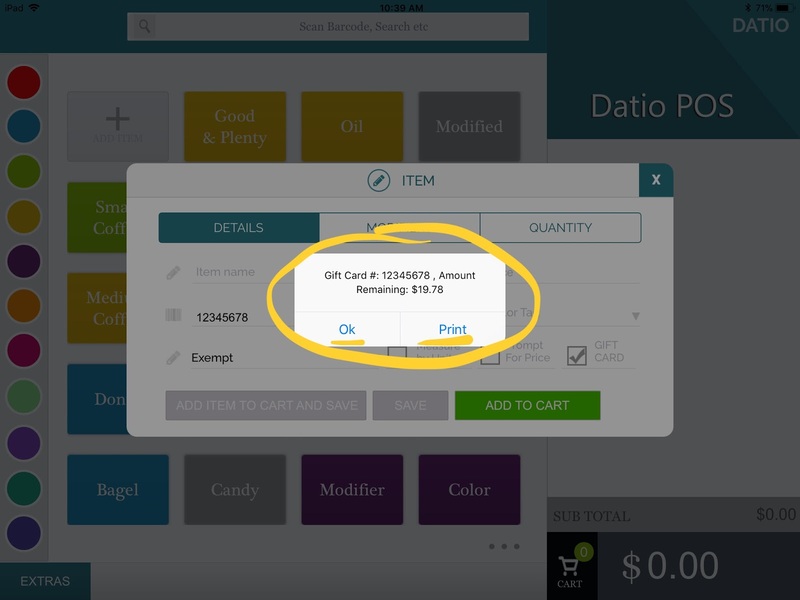 You can also order from our verified partners with your logo or order your gift cards from your preferred supplier; the only requirement is to have a unique barcode on the card. We do not support gift cards with magnetic stripes. 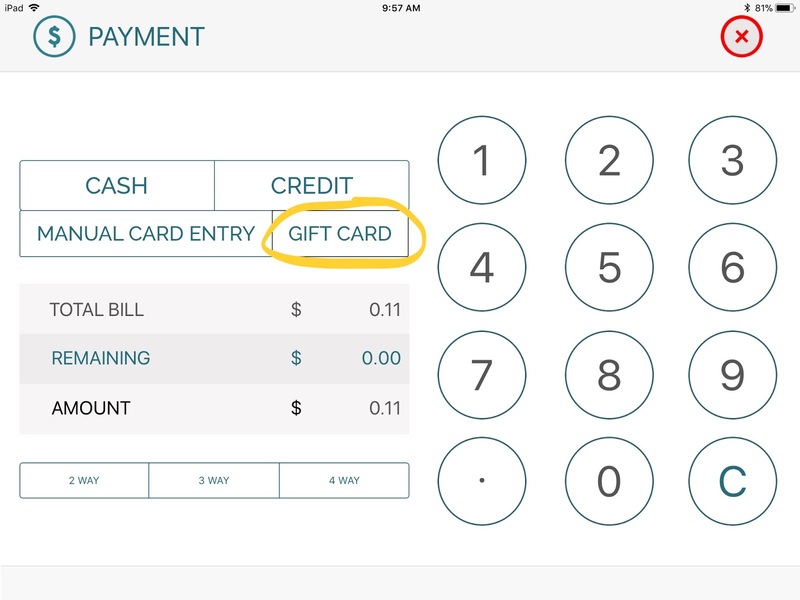 Our gift card service is $11 per month. It is possible to use gift cards as an account. An example is a swimming pool club. You can have a kid's parents pay you in advance to load the kid's accounts. 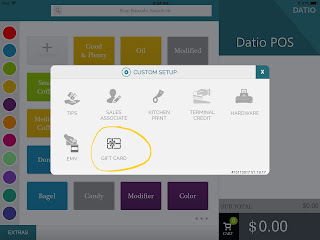 Instead of using a gift card with a barcode, you can use their name as the unique identifier. In this case I might use "johndatio" as the gift card barcode unique identifier. 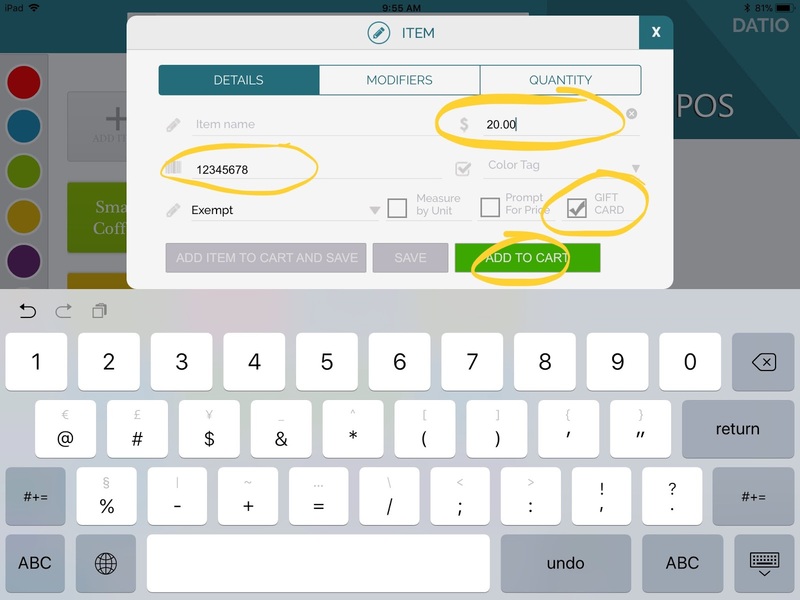 It is important to note that the barcode unique identifier is sensitive to lower case and upper case, treating them as different characters. Then when doing the actual sale I would simply type in the name of "johndatio". To turn on gift cards start from the Datio POS App. 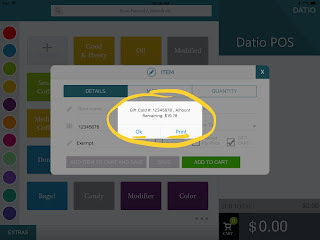 Then go to EXTRAS, CUSTOM SETUP, GIFT CARDS, select "ON" and SAVE. Gift cards are now enabled. Gift Cards are $11 per month to use. 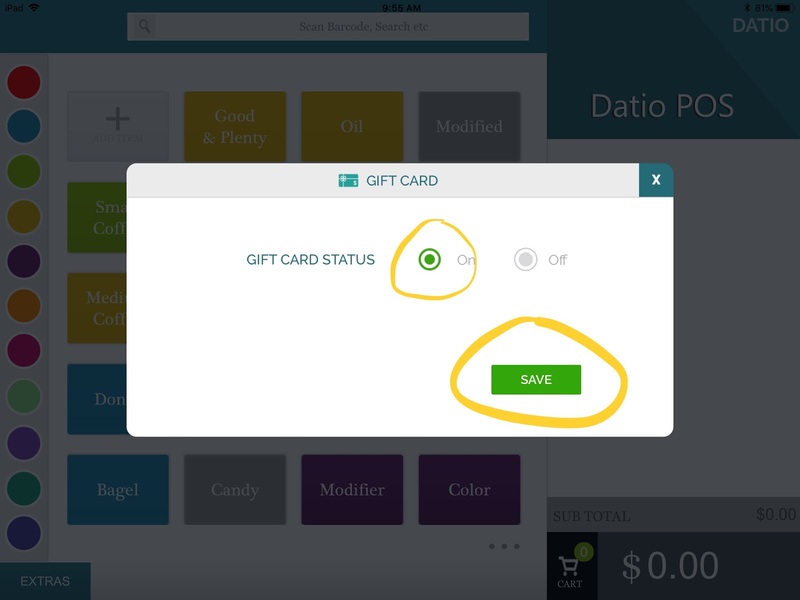 To sell the gift card start in the Datio POS App tap + Add Item. Then tap the box "GIFT CARD." 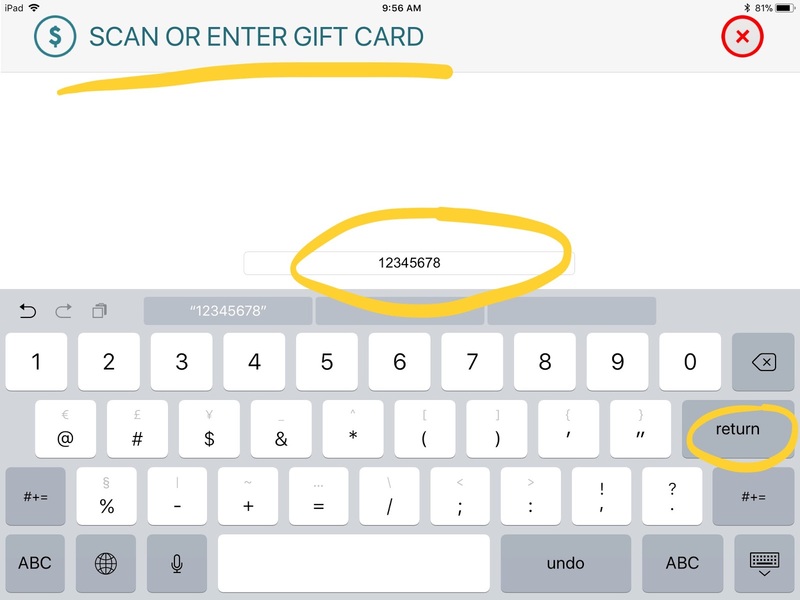 Enter the price and scan the gift card barcode or enter a unique identifier. Next, add to cart and sell the gift card with Cash or Credit like a normal sale. Add items to the cart as you normally would do for a cash or credit sale. 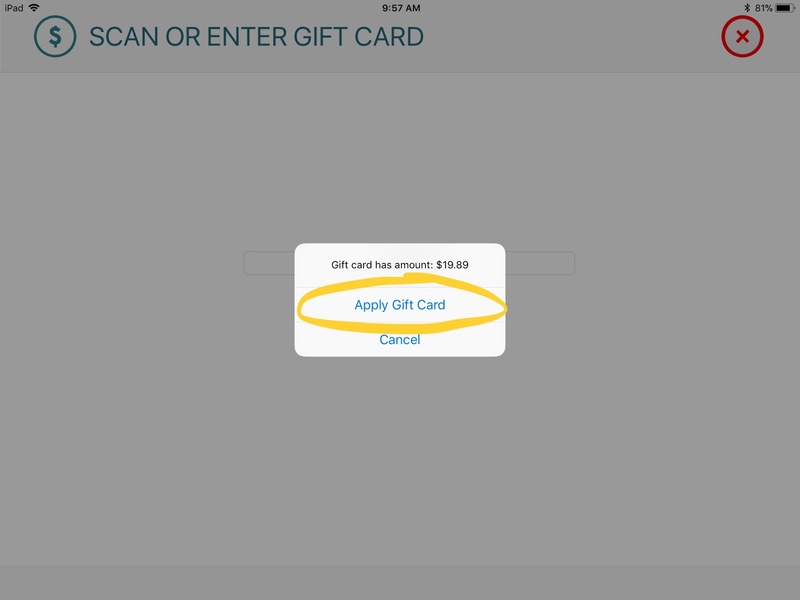 But this time select "GIFT CARD" as the payment method. 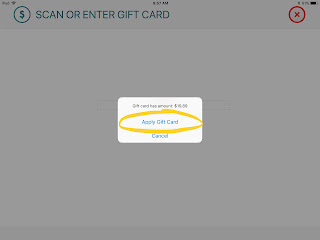 The software will then ask you to enter or scan the gift card. Complete the sale as normal. 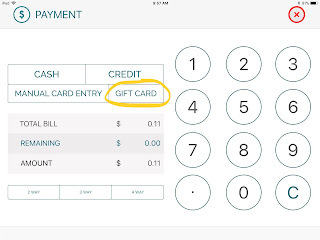 If the gift card doesn't have enough balance to complete the sale, the payment screen will reappear to finish with cash or credit. To check the value of an existing gift card, tap + Add Item, enter the barcode and check GIFT CARD, and then ADD TO CART. You can then print the value if you like.